At long last, Microsoft has announced that Blue Line Innovations’ PowerCost Monitor will the first partner device for Hohm, a web-based energy-monitoring application that offers in-depth personal consumption data. Hohm already automatically uploads energy use data for customers of certain utilities, but the PowerCost Monitor allows anyone living in a single-family detached home to to keep track of power use. 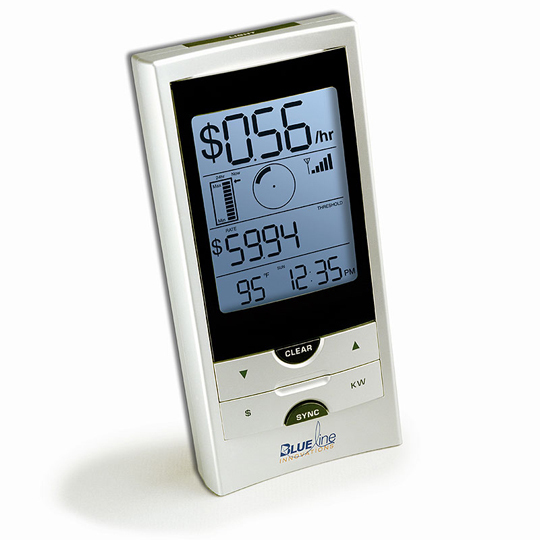 Blue Line’s PowerCost Monitor has actually been available for years, but the company is releasing today a new version specially designed for compatibility with Hohm. It’s not cheap–$249 gets the device, an optical sensor, portable wireless monitor, and WiFi gateway–but Blue Line claims that customers who use the product save up to 18% on energy costs. Microsoft says that it chose the PowerCost Monitor as its first device partner because of its easy installation process–customers just mount an included optical sensor on the outside of their utility meter. The monitor then wirelessly sends energy information to an in-house WiFi gateway that uploads data to Hohm. Eventually, that ecosystem will include thermostats, appliances, and cars. Ford already plans to install Hohm in the Focus next year to make electric vehicle charging more efficient. But at least on the device side of things, Microsoft is lagging behind Google, which announced its first device partner for PowerMeter (a Hohm competitor) last year.